The show where three friends gabble about everything, literally leaving no stone unturned in this off-beat irreverent comedy podcast. Uncensored. Unmoderated. Undeniably fun. Its the triumphant return of the Turkeys! After a hiatus for moving and other misadventures, we the boys have returned, and in a new format! 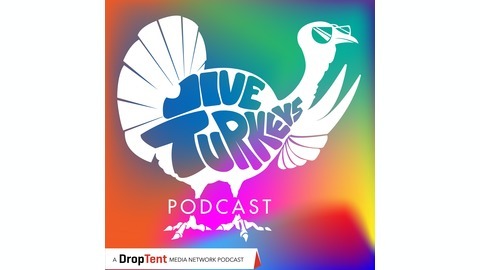 Minus Ty, the remaining two are joined by Uberfan Will as they bellyflop into conversations about Fleshlights with Hitler mustaches, terrible Doordash employees, Jason reveals an odd celebrity he would have a gay tryst with, Jacob can barely contain his excitement about a dog stealing from Walmart, and Will does some Jud-ee chops. Out of Context Quote: "My fish is broken! I demand quality service, FIX MY FISH!" 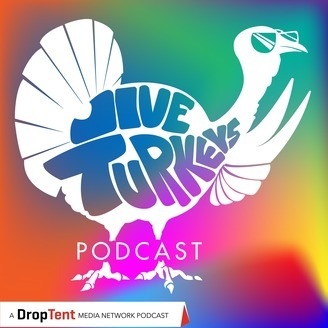 If you would like your questions answered on the show, leave us a message on the Jive Turkeys Facebook Group, tweet us at @JiveTurkeyPod, or email us at jiveturkeyspodcast@gmail.com.